March is a month full of hope for gardeners; spring bulbs are out and you can get onto the soil on good days. The days reach equinox and the extended daylight stimulates growth of buds and seeds. The temperature is unreliable, so it is a good thing to have fleece or cloches ready for when frost is forecast. Sow broad beans, carrots, parsnips, lettuce and peas direct into the soil. Plant out onion and shallot sets, so the tip of the bulb is visible at soil level…watch out, curious birds tend to tweak them out and ground frost can cause the soil to expand and push them up. Start planting first early potatoes. Under glass, germinate aubergines, cucumbers, peppers, chillies and tomatoes. Prune last season’s growth of Hydrangea paniculata to the lowest pair of strong buds (They flower on new growth, unlike the mop-head hydrangeas which need to be cut to the first buds behind the old flower heads). Last year’s growth on Buddleia davidii can be pruned back to a framework to encourage the new growth that bears the flowers. You could propagate Cornus, Cotoneaster, Cotinus, Chaenomeles and Magnolia by layering. If Cornus is grown for its coloured stems, cut it back to a stool near to ground level, or, if that makes you nervous, cut a third of last year’s growth back and leave the rest until next year. Dead-head daffodils but leave the foliage to feed the bulbs. Start Dahlias and Cannas in compost under glass. While the soil is moist, apply a thick mulch to help to retain the moisture over dry periods and to improve soil structure. This will also help to suppress weeds. You can start mowing with the blades on a high setting. Treat with lawn sand for moss control or weed & feed if you can afford it! 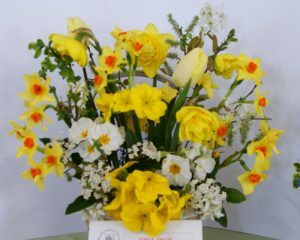 Church Crookham Garden Society hold their Spring Show on 6th April. Please see the website for classes in the handbook. Entries are free for members.